Happy New Year! It’s been a while, and I have a story to share. On Wednesday we went to Bulk Barn. 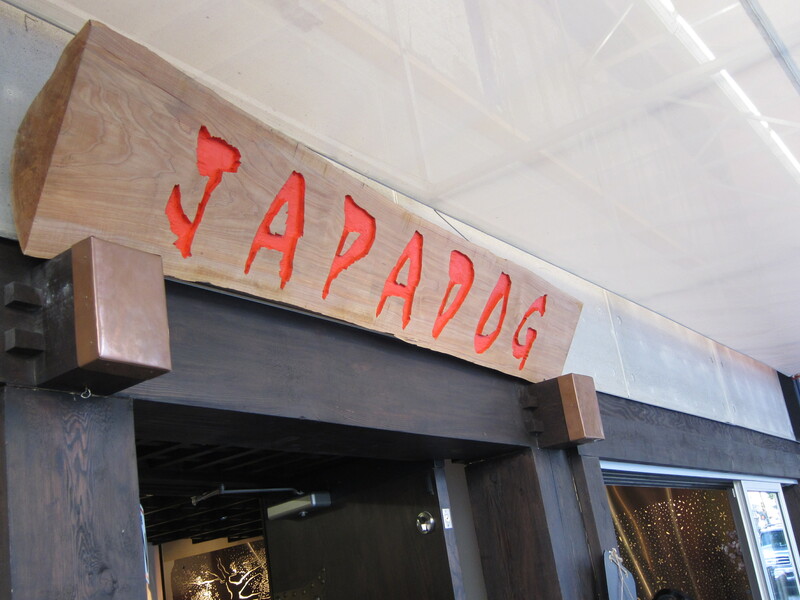 It’s kind of far from home but we had to be in the area, and we were excited to take advantage of the larger selection available there than where we usually buy our bulk goods. Things were going well, we had some peanut butter, (we brought our own tub), walnut pieces, and I was filling a bag with baking soda when an employee approached and told me that I couldn’t use my own bags, I had to use their plastic bags. Apparently they’re afraid that my bags are going to contaminate their food. He actually said that I should put the food already in plastic bags provided by the store. 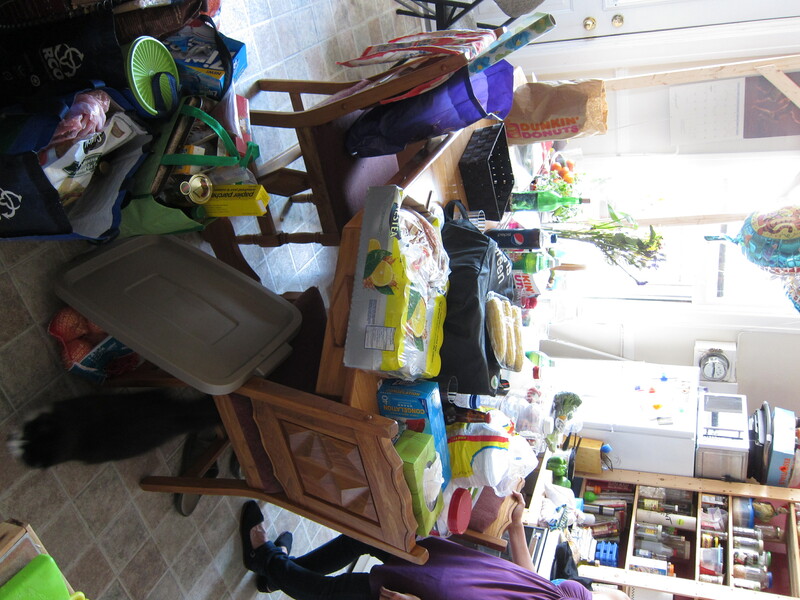 I told him that wasn’t going to happen and I would return the food I had bagged to the bins, (obviously they didn’t want that), throw out the food in their garbage and leave, or buy the food already in my bags. He ran away and I didn’t see him again. Since I knew we were going to have problems I found Joanie and told her what happened, so we went to the cash and paid for our purchases, in our own bags. At the cash the clerk asked us to use the bags provided by Bulk Barn on our next visit and explained a bit more about the rule. Apparently there are people who change their minds after filling bags and empty the bags they have filled back into the bins, so they want people to use new plastic bags which are supposedly sterile. I asked a bit more, but she didn’t have a lot of information, basically it’s a corporate policy to not permit customers to bring their own bags to Bulk Barn, and the people who work in the stores have to enforce the policy. This brings up some interesting questions about buying foods at bulk stores. How clean is the food? By shopping at a bulk store I accept that there might be a bit of cross-contamination in the food I buy. In fact I bought some split yellow peas the other day that had a few lentils mixed in. It’s not the end of the world. I think that we have to trust, to some extent, that the store we buy our food from and the customers who shop there have decent enough hygiene habits to keep the food from becoming dangerous. If I can’t bring my own containers to a bulk store, eliminating the use of packaging, what is the point of shopping there? Many items, (like flour and sugar), are more expensive than buying them in paper bags at Costco or somewhere similar, so I’m probably not saving money. Is it just for the novelty of buying in bulk? As for Bulk Barn, if people putting food back is a concern they maybe they could create a rule along the lines of “you bag it, you buy it.” In fact, that might be a good idea for all bags, even the “sterile” plastic bags. Needless to say we won’t be returning to Bulk Barn anytime soon. Last weekend was Thanksgiving, and I want to share a bit about what we were able to cook and what we learned. We cooked two sort-of traditional Thanksgiving dinners. I say sort-of traditional because we were only feeding a few people at a time, so instead of cooking a whole turkey, we cooked a complete leg each time, and we only had three side dishes plus cranberry sauce for the turkey, so everything was scaled down a bit from the huge Thanksgiving dinners that we have cooked in the past. Turkey legs are also easier to get without any packaging. While I’m sure it is possible to buy a whole turkey that isn’t wrapped in plastic and put it in a huge container, (like a rubbermaid storage container), when buying legs I just needed a big tupperware-type container, which is easier to carry and looks much less ridiculous at the butcher, (I went back to the butcher of Les Fermes Saint-Vincent). The vegetables, (squash, brussels sprouts, and potatoes), were relatively easy to get between our CSA basket and Jean-Talon market. Cranberries are also in season right now so we got some fresh cranberries at the market and turned them into sauce for the turkey. Dessert, however, was a different story. We had apple crumble, which is a totally fine Thanksgiving dessert, but missed having pumpkin pie. The problem with pumpkin pie is that it takes lard to make the pastry. I have discovered that is is possible and probably quite easy to make my own lard by melting down some pork fat and letting it harden, but getting pork fat is a bit of a lottery. They don’t always have it in stock at the butcher, and when they do I have to get there before they put it in a plastic bag and freeze it or melt it down themselves then put it into little plastic tubs to be sold. So we’ve learned that when cooking large meals for special events it pays to start getting all of our ingredients together ahead of time. 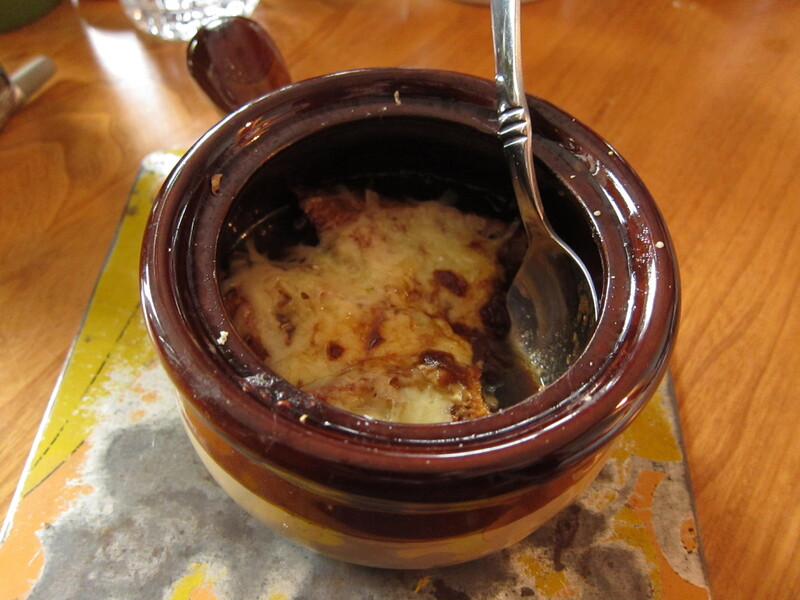 Joanie loves French Onion Soup, and I think it’s pretty good too, so last week when I saw this post on how to make it at home I wanted to try it out. The only problem was that I wanted to do a really good job and we didn’t have any beef stock, and hadn’t found anywhere to get soup bones without making garbage, (we’ve been coasting using chicken bones from our freezer and vegetable stock but we didn’t have any beef bones). Also, to really do it right, we needed some good cheese – preferably Gruyère. Armed with some containers, I went to the market. Since they deal in organic meat I thought that Les Fermes Saint-Vincent would be a good place to try to get a soup bone, and I was right. They didn’t have any soup bones that weren’t already wrapped and frozen so they sold me a good chunk of beef shank and were completely willing to put it in my container. Also, the meat that was on the bone was super deep red. I don’t know if that’s just the colour of the shank or if it’s because the meat is better, but it sure looks good. Next I went to get some cheese. I went to Fromagerie Hamel, because it was close to where I was standing. They said that they couldn’t touch my container because it’s already contaminated, (to be clear, I didn’t bring a dirty container, but I guess anything that they haven’t sterilized is considered contaminated). I’m not sure if this is their company policy or if it’s the law. I’ll have to do some more research to find out. However, they were willing to cut some cheese and just hand it to me, then I could put the cheese in my container. This works for me. Unfortunately, they do wrap their blocks of cheese in saran wrap, and throw out and replace the old sheet of saran wrap every time they cut some cheese, or at least that’s what happened when they cut my cheese. With meat and cheese, I bought a whole wheat baguette and headed home, where Joanie had cut a huge batch of onions. At home I took the meat off of the beef shank and saved it and used the bone and membrane to start making a beef stock. 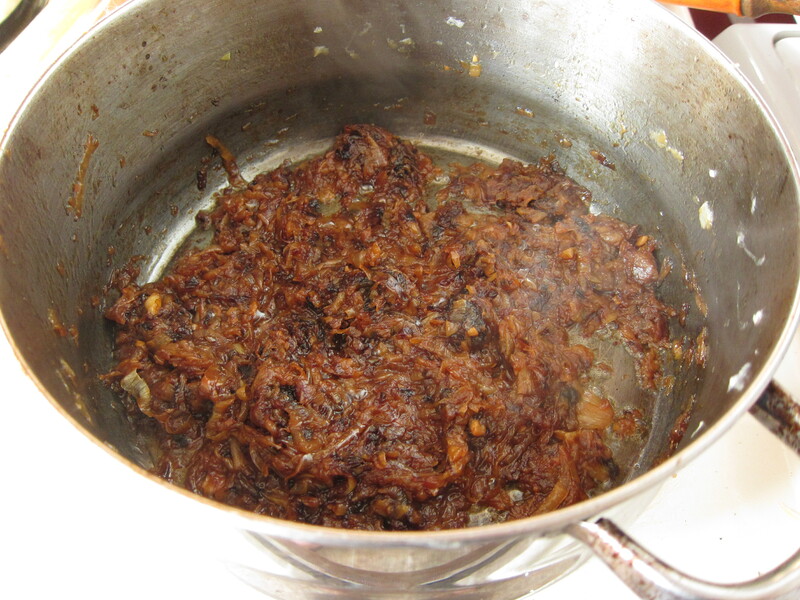 Then we started caramelizing the onions. We pretty much followed the recipe. However, I kind of took the whole caramelization thing too far and we ended up with an extremely sweet soup. 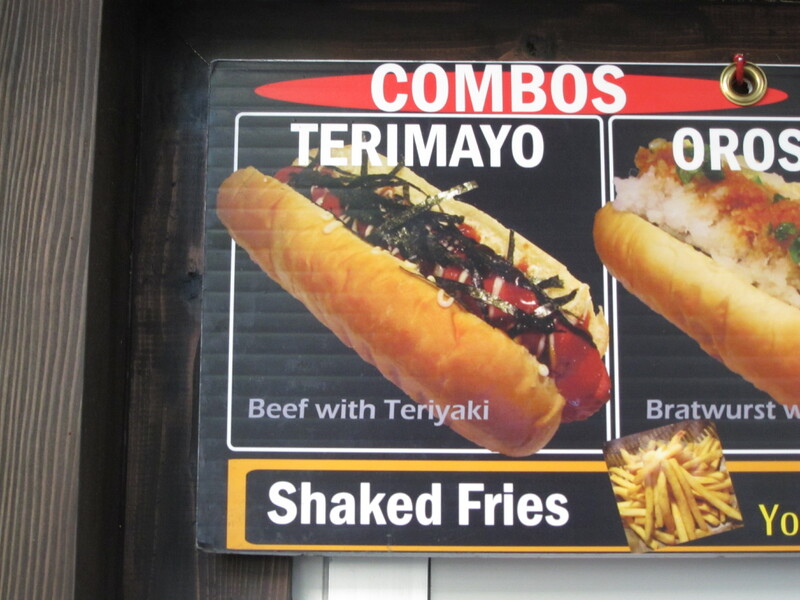 Next time, there will be less caramelization and more onion flavour. Super Caramelized - I got a bit carried away. This pot was full when we started. However, with some good bread, good cheese, and yes, a ton of flavour the soup came out pretty well, especially since it was our first attempt ever at French Onion Soup. Next time it’ll be even better. The last of the soup, in my bowl, ready for eating. A couple of weeks ago Joanie & I watched the entire season of The 100 Mile Challenge online. If you’re not familiar with it, it’s a TV show that challenged families in Mission, BC, to eat only food from within 100 miles of their home for 100 days, (based on the book, The 100 Mile Diet). One of the things that happened on the show was that people figured out how to meet their basic food needs and then stopped exploring their options. 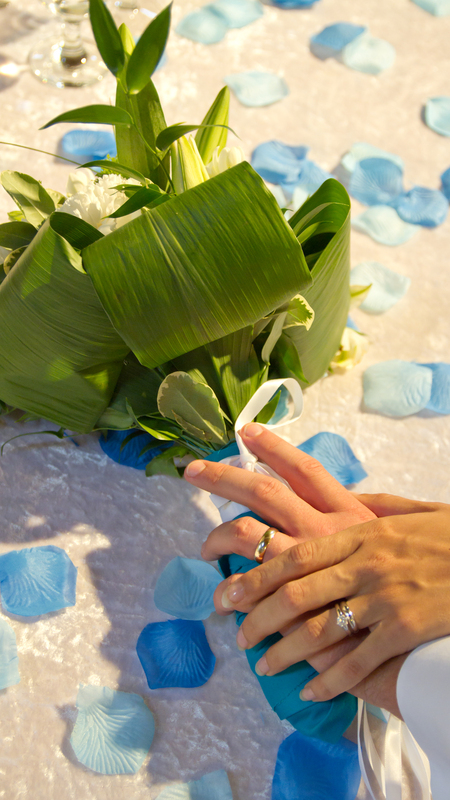 We realized that we have done the same thing. There are a few things that we like eating and can eat easily without making any garbage, and that’s what we eat. BORING. This isn’t exclusively a no-garbage problem, it happened to us before we stopped making garbage, and I’m sure it happens to other people as well. However, when you’re not making garbage it’s not quite as easy break up the boredom – you can’t easily grab takeout. So, from here on in, we’re going to explore new frontiers of no-garbage eating. There are things we haven’t really figured out that we need to figure out. One such thing is meat – the only no-garbage meat we bought up until yesterday is sausage, and we can’t, (or shouldn’t), live exclusively on vegetarian food and sausage, so yesterday for the first time I bought a chunk of meat in a container. We want to find more sources of meat. Also fish. We haven’t had great success buying seafood so far. Also oil. We thought we had a place to buy olive oil in bulk lined up but they have stopped selling it, and the only other place we know of costs four times the price. There’s tons more to explore, so let the exploration begin! At the market on Saturday we saw apples for a dollar a basket, and the basket was pretty large. We also had some apples at home already from our weekly vegetable basket, and since we’ve been getting a lot of apple recently we are tired of Apple Crisp. By combining $1 of apples from the market and the apples we had at home we had enough to make and can a good batch of applesauce that we can use later this winter. This applesauce, which cost us all of a dollar, and the tomatoes we just canned, really show the advantages of buying in season and preserving food. We realized yesterday that we should buy & preserve some cranberries right now as they’re in season, and if we want some around Christmas they’ll be really tough to get without packaging, so that will likely be next on the preservation list, well, cranberries or pumpkin. The other day when Joanie went out to work she called me almost as soon as she left to tell me the neighbour had put out a bunch of books in the recycling. 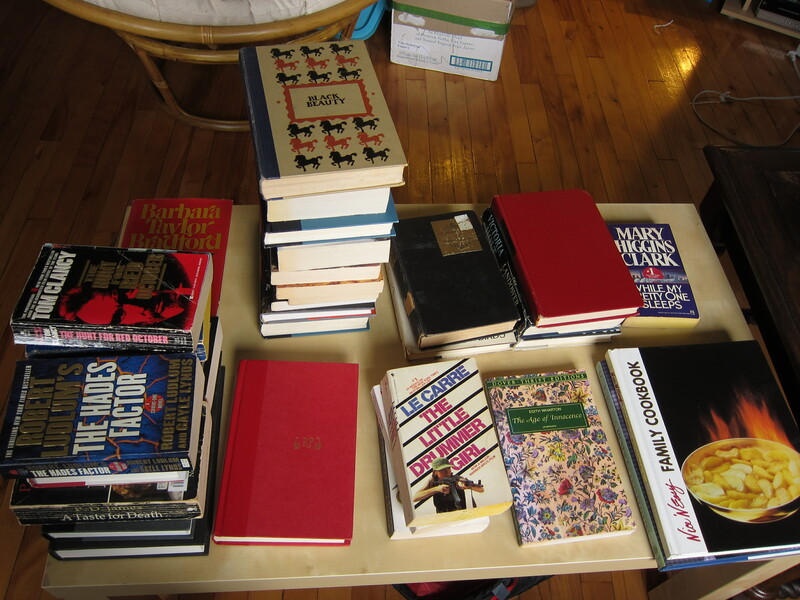 I went and checked and there were thirty-six books, and most of them are worth reading! I collected them and will read the ones I’m interested in and don’t have already, and the rest will be sold, given to a used book store, or something. One man’s trash is another man’s treasure was true last week. We’ll keep keeping our eyes open and maybe we can remove some more stuff from the waste stream. We got all of this for free. We enjoy using tomatoes in our cooking. When it’s cold out a good chili or spaghetti with sauce really warms us up. Before we started living without garbage we would use fresh tomatoes when they were available, and cheap, and when we couldn’t easily find fresh tomatoes, or were too lazy to chop them, we would buy cans of tomatoes from the supermarket. Now that we’re living without making garbage we can’t buy cans – what should we do? 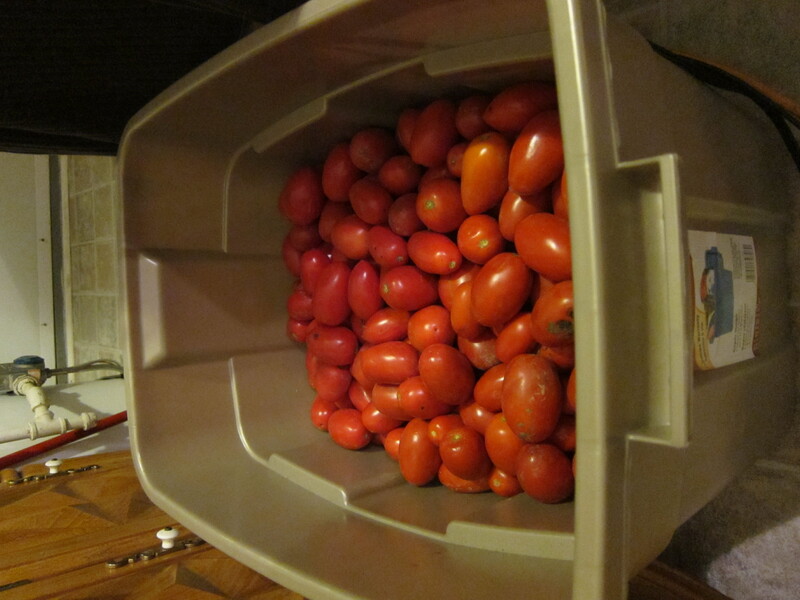 This year we tried to can enough tomatoes for the winter. We’ve canned before. A couple of years ago we made some ketchup and some jam, and we both come from households where canning was at least known to us. We figured a tomato paste would be the most efficient way to store a bunch of tomatoes for the winter, so we Googled canning tomato paste in a water bath and found this site with instructions. I also took a look at a Bernardin canning book while I was in Canadian Tire buying new snap lids for the jars. While acidy foods are reasonably safe to can in a water bath, and non-acidy foods should be canned in a pressure cooker, tomatoes fall kind of in the middle. If you want to can them in a water bath you need to add acid. There’s an enzyme in tomatoes that will cause the liquid to separate from the pulp – in a bad way – fairly quickly after they’re cut, so they need to be cooked quite quickly after they’re cut to stop this from happening. Fresh and ready to go. 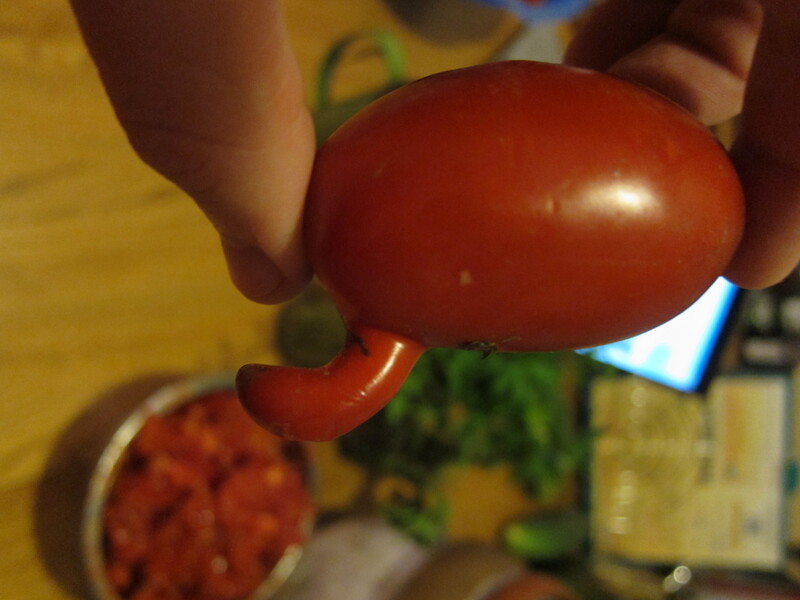 This is a boy tomato. First, all of the tomatoes had to be peeled, de-seeded, and cooked. It’s quite a process. The tomatoes have to scored, then dipped for a few seconds in boiling water to loosen the skins, then the skins are slipped off and the tomatoes sliced in half, then we took out the seeds with our fingers and cut out the hard bits where the stem joins the tomatoes. As the tomatoes were ready they went into our pot to be cooked. This went on for hours – you saw how many tomatoes we had. Once all of the tomatoes were cooked we went to bed – it was late. The tomatoes, in 2 pots, went into the fridge for a couple of days. When we were ready to face the tomatoes again we bought a bunch of red peppers – both our web link and the Bernardin book said to add a bunch of peppers to the mix, I’m guessing to increase the acidity of the final product. I bought a big basket of red peppers from Atwater market in a rainstorm, then we chopped them up and put a bunch of them in with the tomatoes, and cooked some more until the peppers were soft, then we got out the wand blender and blended both pots to make sure our mix was fairly smooth. 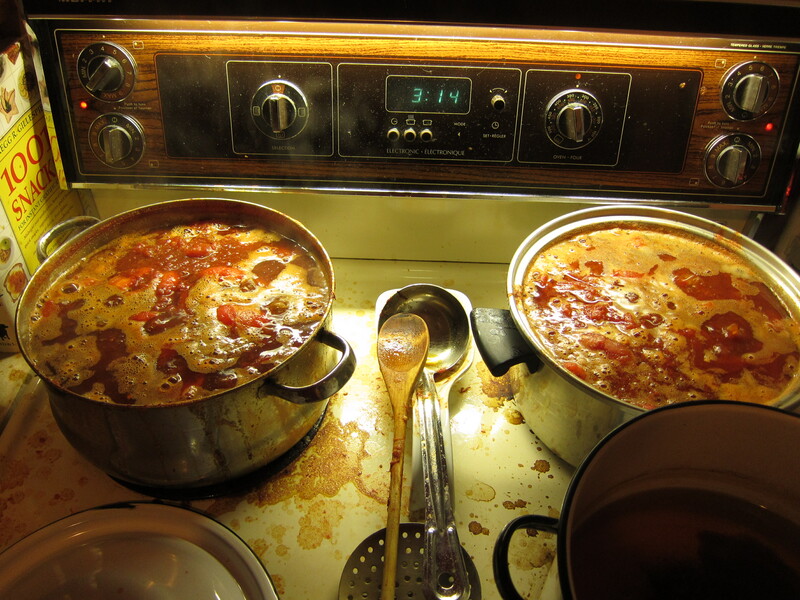 By this point tons and tons of water had been boiled out of the tomatoes – you should have seen our windows! The final step before putting the tomatoes in jars was to add a bunch of lemon juice to increase the acidity of the mix. The tomato canning article recommends using store-bought lemon juice for it’s constant pH, however it comes in a bottle and I don’t know where to buy it in bulk, so I bought 32 lemons and got out my citrus juicer. I needed several cups of juice, and I got it. 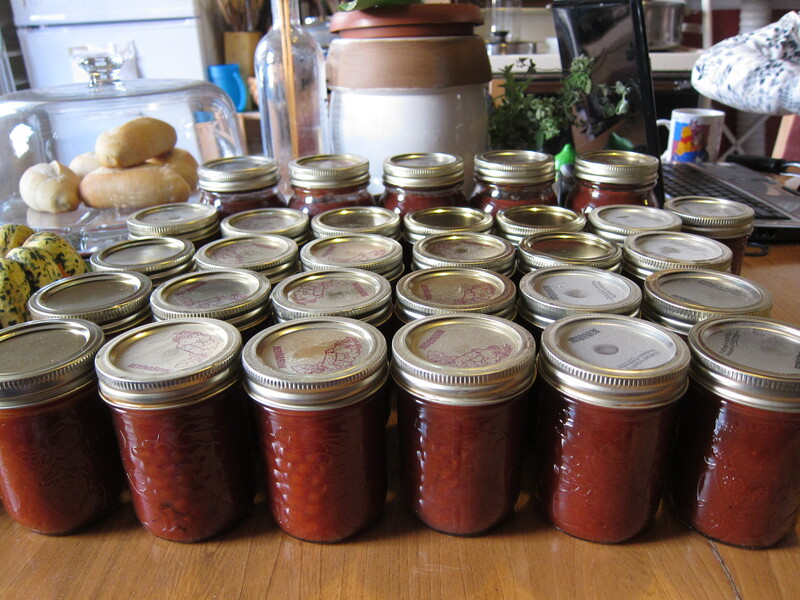 When it came to canning the tomato mix it was fairly straightforward. With jars, lids, and rings sterilized, I put the tomato into jars, added some more lemon juice to the top of every jar, sealed them, and put them in boiling water for about an hour. Everywhere we saw said that 40 minutes was enough, but I wanted to make sure that the tomatoes were well-sterilized so I boiled them for an hour. Our stock pot that I was using for canning isn’t that huge, so I had to keep topping up the water to keep the jars covered. When topping up I made sure the water was boiling first in our kettle, that way the jars kept processing in the pot. All went well, one jar broke in the pot and made a mess of the water, so the water had to be changed after that batch, and all of our non-broken jars sealed. 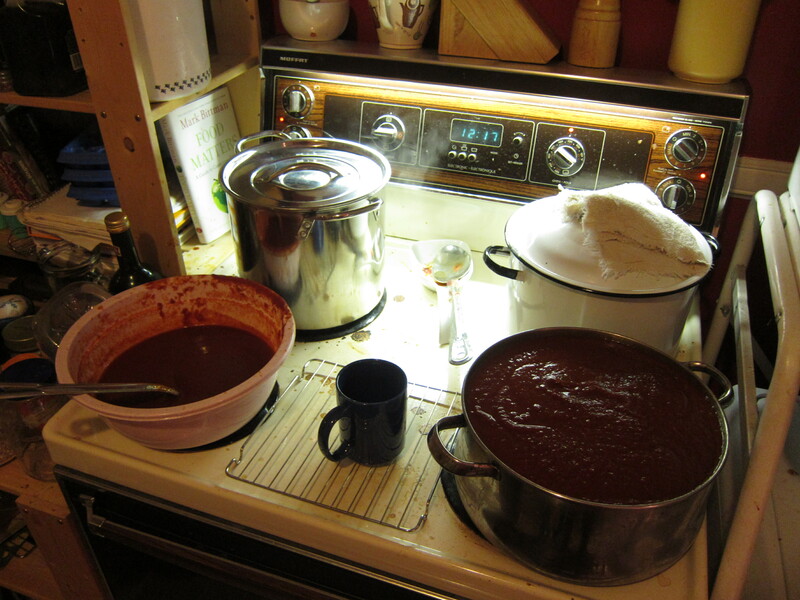 Canning in action: The silver pot has jars in it processing, the white pot has hot, sterile, lids & rings in hot water, the pot & bowl in the front have hot tomato mix, and the oven has hot, sterile, empty jars. This is the one that broke - I didn't think I was that rough with it! So, was it worth it? We’ll see. 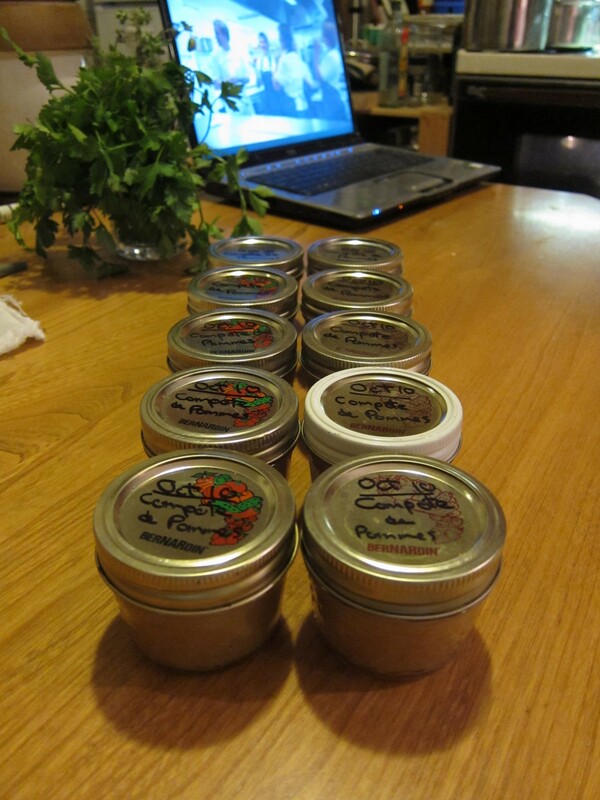 We ended up with 25 250ml jars, (about 1/2 pint), and 5 500ml jars. The tomato mix in it is more condensed than the can of crushed tomatoes from the store, but less condensed than store-bought tomato paste. We also have 18 cans of store-bought tomatoes, (a mix of diced and crushed), that we bought before we started living without making garbage. We’ll be trying to eat more seasonally, so we’ll try to reduce the number of times we make a big chili, and when we do fill it out with a lot of beans and stuff, and we’ll see in the spring if we made enough tomatoes for the winter. Price-wise it wasn’t worth it. It would have been cheaper to just buy cans of tomatoes from the store. We spent $14 on tomatoes, about $12 on lemons, and about $10 on peppers. This is a total of $36 for 31 jars of tomato. It would have been possible to be cheaper, if I had been able to get the lemons at a better price, (I’ve seem them at half the price I paid, but I didn’t exactly pay top dollar), or if I had bought the peppers at Jean-Talon market instead of Atwater, (produce is much cheaper at Jean-Talon, but it’s a lot farther from our apartment). At ninety-nine cents a per can the store is cheaper than our cost was this year, but makes more garbage. This brings us to another important point. We’re using jars with snap lids. These are metal lids that can only be used once for canning. You can use them again for other things – for example I have some jars full of nails that have used lids on them, but every time you can with these jars you need new lids, so eventually we have to throw out or recycle some older lids, or find something else to do with them. Also, the snap lids come in a box and may be coated with Bisphenol A. Next year, or whenever we run out of lids, we’ll be looking into non-disposable lid options. 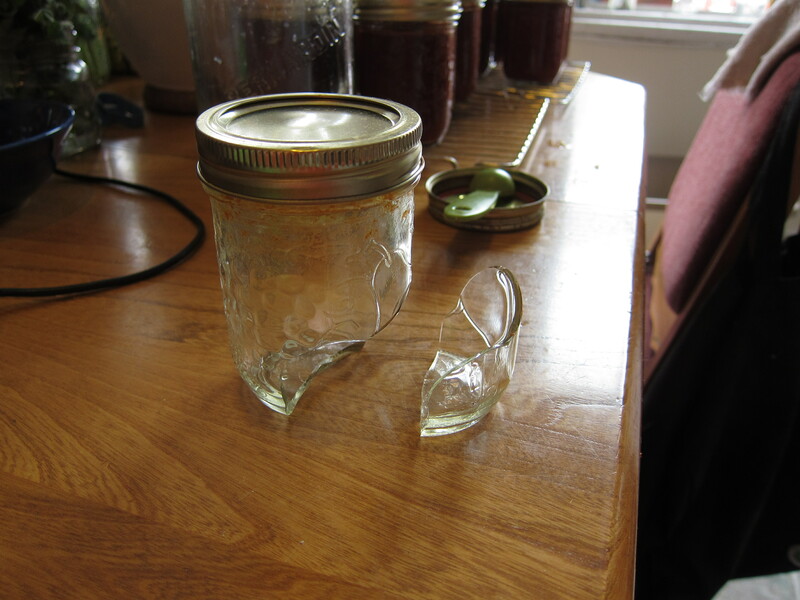 Ideally I would like to find glass lids that fit on our standard-size jars. If that’s not possible the Tattler lids may be a good option, or we can look into replacing any jars that break or we give away with all-glass jars. 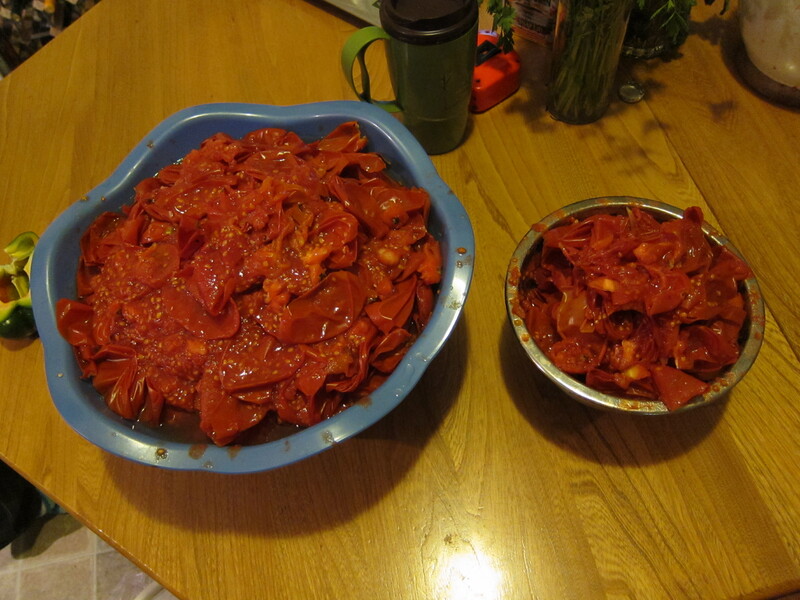 These are all of the tomato skins & guts that we composted. This brings up an interesting thought. If we had used a food mill, could we have simply halved the tomatoes, cooked them, then run them through the food mill and let that remove the seeds and skins? Our mix would have been a bit more watery, but that could probably have been solved by spooning some liquid off the top, or straining some of the mix with cheesecloth. I think we might also have had less tomato waste as there was some loss from hand-peeling and hand-seeding all of the tomatoes. If we had a bigger pot we could have processed more jars at a time, and if we had a pressure cooker we might not need to put all the lemons and peppers into our mix. A lot of the “Is it worth it?” question depends on our equipment and how good the food tastes. This year it is worth it, the tomatoes taste great, and I’m sure are much fresher than what ends up in cans at stores, and we learned a lot. If we’re able to find a food mill and pressure cooker, or at least larger pot, without packaging, next year it will be even more worth it, maybe even financially. This year, we’ll simply enjoy our tomatoes knowing they’re from the fields of Québec, knowing exactly what went into them, and knowing very little garbage was made to preserve them. Finished and ready for labelling and storage. Those who know me know that I love coffee. I must drink, on average, 3 cups a day, (and they’re big travel cups). Often I’ll have a coffee at home but I also love having a coffee on the way to work or after work to relax. For a while now I’ve been taking my Tim Hortons reusable travel mug everywhere with me and I don’t get a coffee to go unless I have it and can use it. When I go to Tim Hortons I don’t have any problems with garbage because milk and sugar, (or in my case, hot chocolate), is added to my coffee by a machine behind the counter. There are also lots of independent cafés that have milk and sugar in large containers so you dump as much, (or as little), as you need in your cup and you’re ready to go. However, I’ve started to realize that there are cafés, often Second Cup, where the only way to get sugar is in little single-serve packets. Lots of restaurants also have milk and sugar in individual packets. I asked myself how to deal with this problem. I am going to start carrying in my bag, with my reusable cup, a little container of sugar. Then I’ll be able to put as much sugar as I want in my coffee without garbage and refill the container at the house when I need to . I’ll try to avoid restaurants and cafés where milk is served in single-serve packages because I can’t carry milk around with me all day unrefrigerated. At least that will be a start. I will also start to carry a spoon to stir my coffee so I don’t have to use a little plastic or wooden stick. These things aren’t very big or heavy, I just have to remember to bring them.